Joe Blogs: Buy me !! With the news about Chelsea chasing Ronaldinho in full flow now. 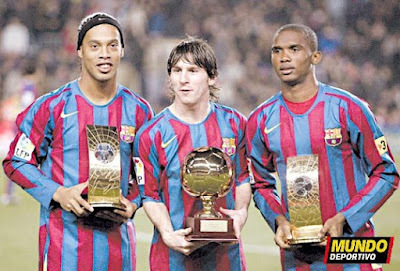 many sites are talking about the so called fantastic four at Barca. They state with the arrival of Henry that one of the above may be leaving. It's stated that although not liked behind the scenes Eto'o it the boy and with Messi the fans favourite that leaves Ronnie. I think that it would be great to see him but I see it as highly unlikely as he is adored there and this is probably just the agent trying to get him a wage increase at Barca. Settling into work alright now but it's evident I need more money so I have applied for a few evening and weekend jobs. The way I see it is that to nail down a house and start building a decent future I need to put in the hours now so that I can ease of later in life. If all the jobs I applied for this evening were to accept me I would be earning well over 50k. Downside of that would be that I wouldn't see my children and partner. Where's that lottery win or instead of paying £85 million for Ronnie, Roman could give it to me to look after!!!!!! !